Whole Health Supply, seller of KlipPro products via Amazon.com, announces a brand new straight blade nail clipper which has 4mm wide jaw. This is the type of nail clipper preferred by professionals and those who suffer in-grown toenails. It is products like the KP-240L that get us excited about our company every morning we come to work. Our mission is to bring new, unique and useful personal care products to the U.S. Whole Health Supply is happy to announce a new product that customers have requested. Now, via Amazon.com, their new KlipPro KP-240L clipper is available to the public. This is an unusual clipper because it opens to a generous 4mm wide jaw which is substantially wider than the average clipper. Everything about this product is concentrated on ease of use, functionality and durability. It is made from brushed stainless steel which will never rust. Just a gentle wipe of alcohol will sanitize the edges. It has a reinforced 2.5mm thick handle for extra cutting force. Not only is it sold with a 30 day satisfaction guarantee but a lifetime warranty as well. The straight edge nail clipper is the choice for professional spas and podiatrists. By cutting straight across, the person with thicker than normal toenails can avoid ingrown nails. If further grooming is desired, the clipper has a 1.7" x 0.7" built-in nail file. It also has an anchor where it can be attached to a key chain so it can always be on hand. The KP-240L measures 3.3" x 0.6" x 0.7" making it easier to handle and effortless to maneuver. It is easier than ever for anyone to cut their nails even if they have tired hands or weak fingers. KlipPro Large Nail Clippers allow anyone, no matter what their hand size or finger strength, to precisely cut their nails with absolutely no tearing or splitting. 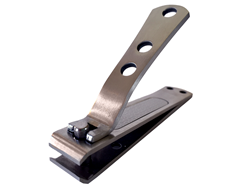 Anyone who has tried to cut their own thick toenails will appreciate the ease and precision of this new tool. Since there is no tearing, there are no rough edges that can be evident after attempting to cut with a smaller clipper. The handles are designed so they cut with the least amount of pressure possible.